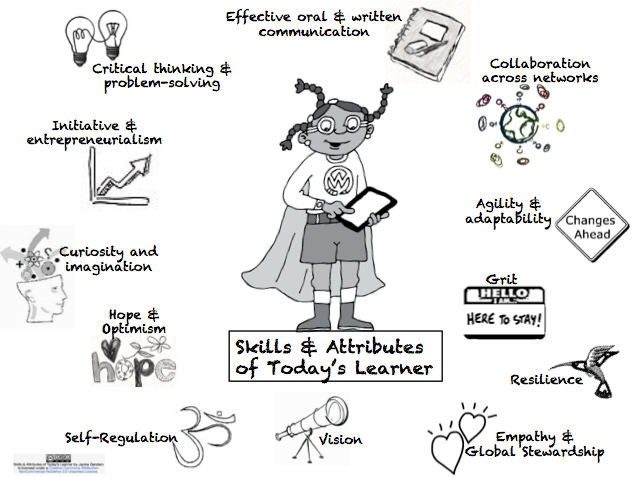 The visual image I use to describe this is that there are all of these unconnected facts floating around in the learner’s brain. Since they have nothing to connect to, they end up flying away. This is especially true for abstract concepts. 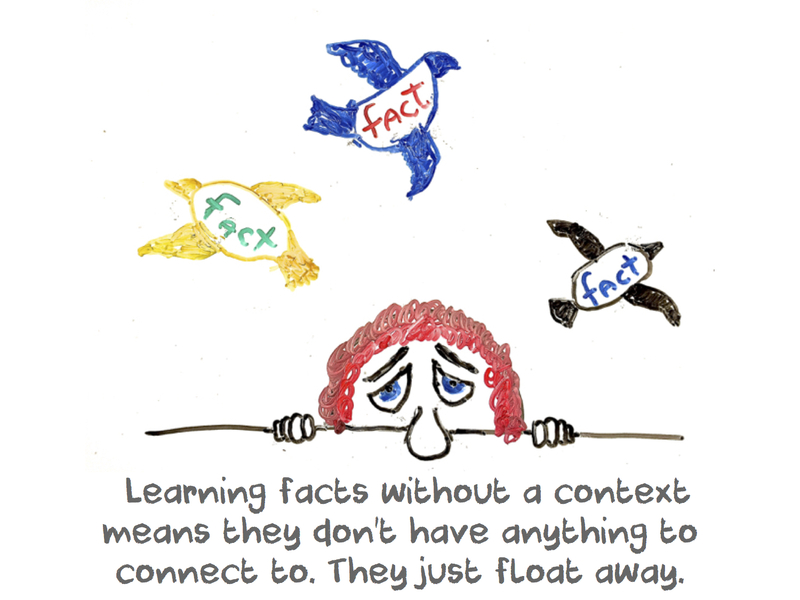 Memorizing facts often means a waste of students’ time and energy. In some cases, too many cases, learners lose their passion and excitement for a subject or topic that, if taught in another way, may have not been the case. Learning facts and knowledge about a content area topic is an important prerequisite to understanding that topic and then developing expertise. The key to this understanding is providing a context for the facts. 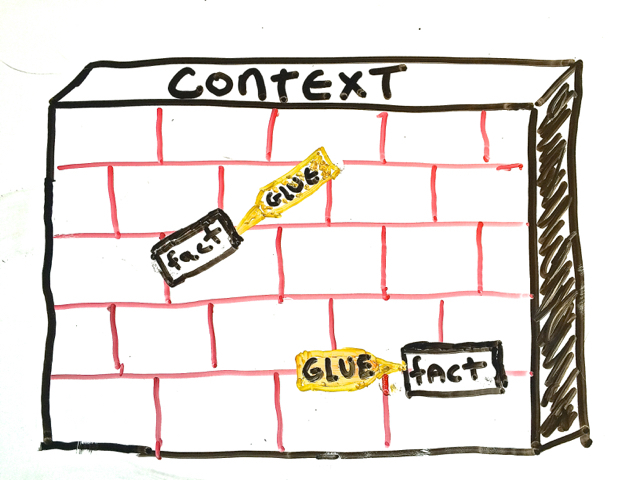 The context becomes the glue to increase the stickiness, the longevity of long term memory of those facts. This is especially true for abstract concepts. These concepts need something concrete with which to attach. Authentic learning can be the driving force for increasing context and relevancy. Jan Herrington describes authentic learning along two axes – the authenticity of the task is on one axis (from authentic to decontextualised), and the setting is on the other (the classroom/university to the real setting). The goal of educators should be to increase authenticity which leads to more contextual learning (and vice versa). The bottom line is that regardless of the content area, students deserve educations that have self-perceived authenticity, relevancy, and a context that makes sense. Explicitly state and record the metacognitive process while learning. Demonstrate and articulate the actual steps of learning. Record the stages of artifact development. Understand and embrace the iterative process of learning. Use and demonstrate the self-evaluative reflection process. Deep Understanding of Metacognitive Processes The educator should be familiar with and able to demonstrate metacognitive processes. “The most effective learners are metacognitive; that is, they are mindful of how they learn, set personal learning goals, regularly self-assess and adjust their performance, and use strategies to support their learning” (http://sites.cdnis.edu.hk/school/ls/2011/05/12/teachers-as-lead-learners/). Developing one’s on metacognitive skills begins with developing an awareness of one’s own thought processes while learning new things. Once this awareness is developed, the steps of learning can be more clearly articulated. How do I gather information about what it is that I want to learn? What are the steps am I taking to learn? How do I know if I am adequately acquiring the knowledge, skills, etc., related to that learning? What do I do when I get stuck? What do I do when I need help? So related to the metacognitive process, if the educator records the steps to their learning process, this can help make it more overt and obvious. 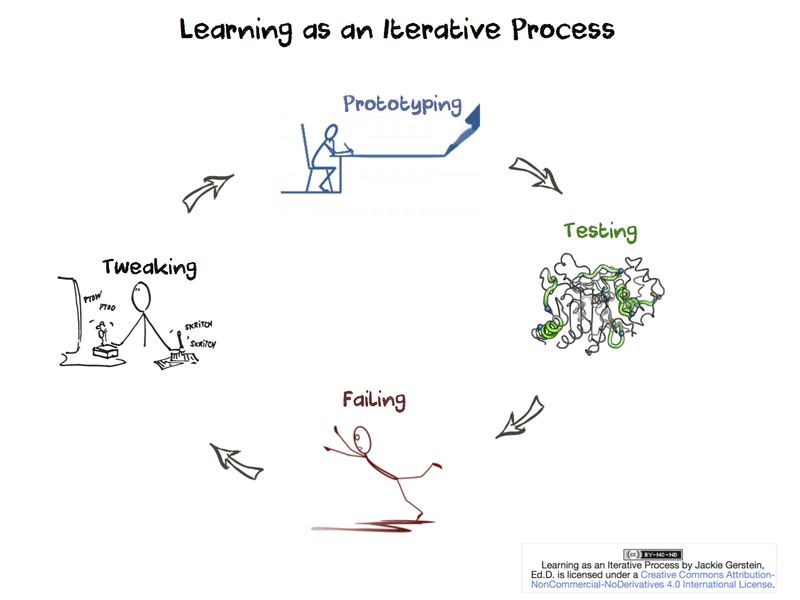 Understand and Embrace the Iterative Process of Learning The following video discusses that “effective” learning is often iterative which involves prototyping, testing, failing, tweaking, and then repeating this cycle. 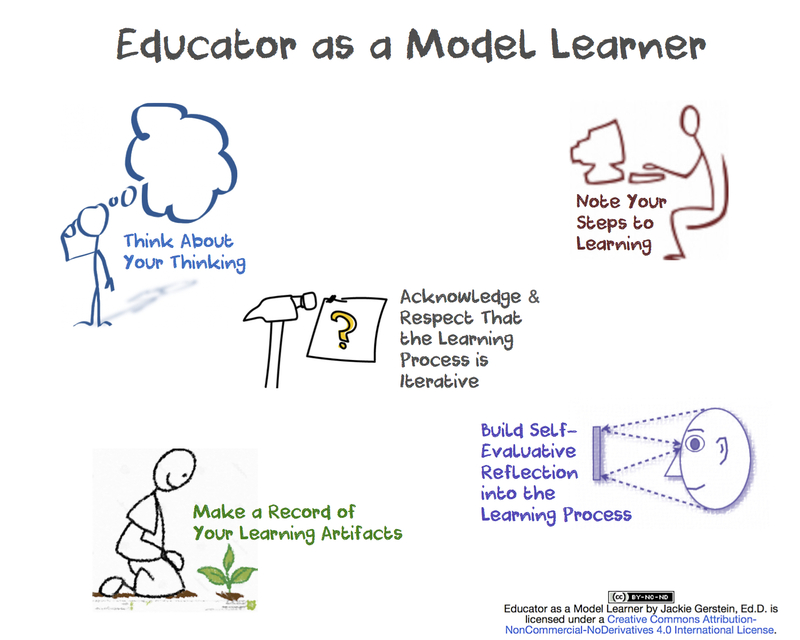 The educator as a lead learner normalizes, embraces, models, and reinforces the iterative process of learning. Record the Stages of Artifact Development This strategy can be especially useful if the goal is to create or make something. It can include writing something, learning a new skill, and making something (as in Maker Education). Too often education techniques focus on exemplary models. This gives the message that perfection is expected – not respecting that there are several stages, often several prototypes or iterations on the road towards perfection. Recording those iterations as artifacts through images, pictures, descriptive narratives will support and reinforce learning as a process. The importance of learning new things; the importance of being a lifelong learner. 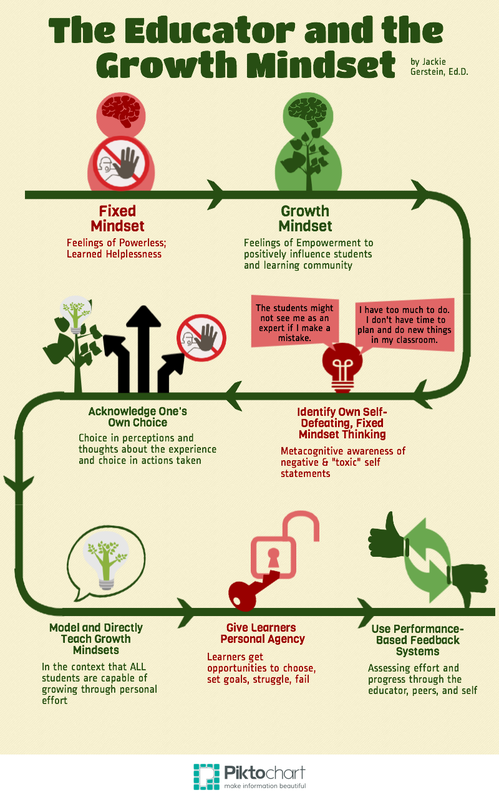 The importance of a growth mindset; that growth is possible during any time of one’s career. This post is a teaser for, a taste of a panel in which I am participating at The International Conference of Creativity, Thinking & Education in April, 2015 (please consider attending). The panel and this post focus on the idea of orbiting the giant hairball of education. Orbiting the Giant Hairball by Gordan MacKenzie is the inspiration for both the panel and this post. The theme revolves around how the systems of business and education often proclaim an affinity towards creativity of and by supervisors, employees, and stakeholders but in practice, actually stifle any actions that threaten the status quo. Growing Up and Out of Creativity in the System of School I believe one of the greatest ethical breaches of our school systems is training learners (and often educators) out of their love of learning and personal passions and creativity. Many new educators enter the institution or system of education with high ideals, high energy and high creativity. In order to fit in, they work hard to conform to the guidelines, rules, and regulations; overt and covert; expressed and hidden, of that institution. Often, the result, sadly, is having their creativity sucked out of them – both as professional educators and as humans. They become victims of the giant hairball of institutionalized education. Orbiting Around the System of School The purpose of this post, actually, is not to emphasize the dire straits schools are in regarding creativity. 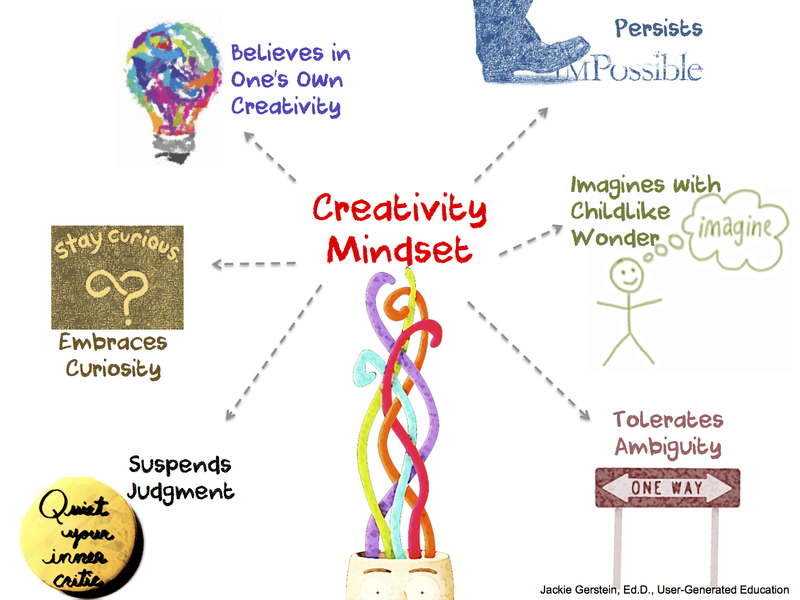 The purpose is to propose a call to action for educators to be creativity facilitators – to facilitate their own and their students’ natural propensity for creativity. To do so, they need to learn to orbit the giant hairball of school. 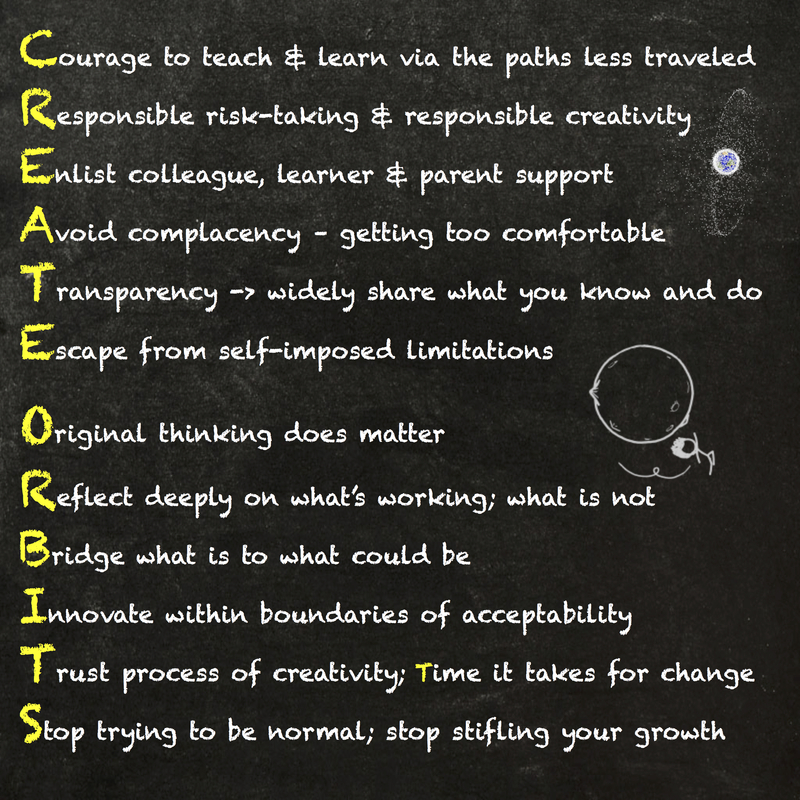 The following acrostic-based poster, Create Orbits (informally titled An Educator’s Soul Survivor Kit), proposes strategies to assist educators who want to learn how to orbit the giant hairball of schools – to remain creative, excited, and energized (and assist learners to do the same) within acceptable boundaries of the school system. Can Any School Foster Pure Creativity?